I’ve been seeing variations of this Crispy Cheddar Chicken with Creamy Sauce recipe around the internet for a while now and I’m so happy I finally made my own version. It’s simple, it makes a lot and it’s definitely comfort food. I used corn flake crumbs rather than Ritz crackers and made a few other changes to lighten it up and I was really pleased with the results. The cheese in the crispy coating is delicious and helps the coating stick really well to the chicken when it bakes. The creamy sauce is made mostly cream of chicken soup, but you can definitely substitute cream of mushroom if you prefer. I know some people do not like the “cream of” condensed soups, and if that’s you, you can easily just omit the sauce or make a cheese sauce or something similar from scratch. 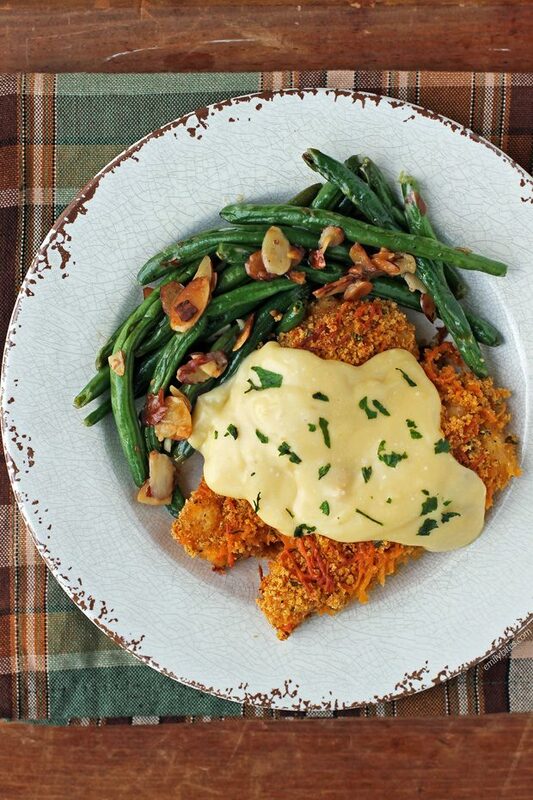 I happen to think the cream of chicken sauce tastes great with this crispy cheddar chicken, but I totally understand that it’s not everyone’s cup of tea. 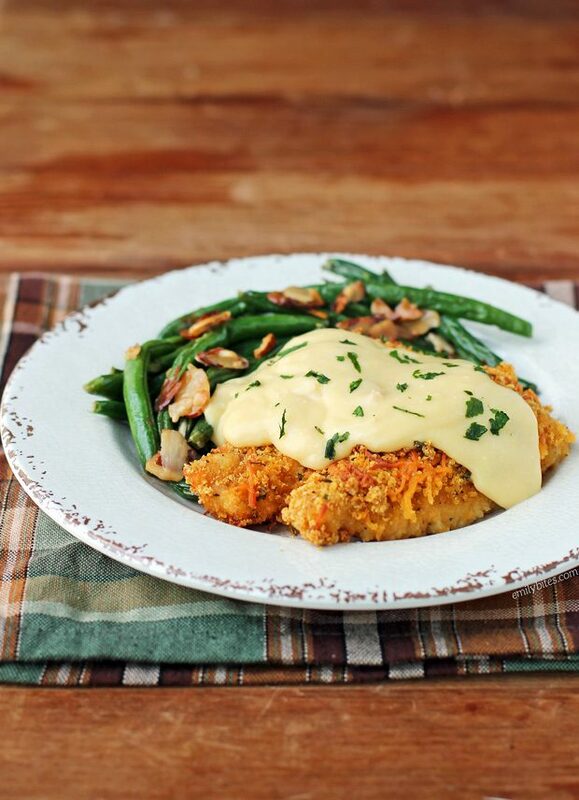 This Crispy Cheddar Chicken with Creamy Sauce is a great dish for dinner with the family because I can easily see it being a hit with kids and adults alike. Plus it’s just 337 calories or 5 Weight Watchers Freestyle SmartPoints for a filling serving and it pairs perfectly with almost any veggie side. Looking for more tasty chicken recipes? Check out my Chicken Pot Pasta, Buffalo Chicken Dip, Mexican Chicken Cauliflower Rice Skillet, Buffalo Chicken Stuffed Sweet Potatoes, Bruschetta Topped Balsamic Chicken, Lemon Chicken Orzo, Greek Chicken Tacos, Baked Chicken Tenders, Chicken Cordon Bleu, Cheesy Buffalo Chicken Potato Bake, Mediterranean Topped Grilled Chicken, Barbecue Chicken Enchiladas, Chicken Parmesan Stuffed Shells, Slow Cooker Kickin’ Chicken Pasta, Pimento Cheese Stuffed Chicken, Buffalo Chicken Soup, Cheddar Ranch Chicken Tenders, Spicy Southwest Chicken Wraps, Cream Cheese Stuffed Everything Chicken, Cheesy Bacon BBQ Chicken, Bubble Up Chicken Pot Pie Casserole, Creamy Chicken and Wild Rice Soup and so many more in the Chicken section of my recipe index! Pre-heat your oven to 400 degrees. Lightly mist a 9×13 baking dish with cooking spray and set aside. Place the chicken pieces into a gallon zip top bag with the flour and seal. Shake/massage the bag contents until the chicken is coated with flour. In a shallow dish, combine the egg whites and milk and beat together lightly with a whisk or fork. In a separate shallow dish, combine the corn flake crumbs, salt, pepper, onion powder, parsley and shredded cheddar and stir together until well combined. Take one of the chicken pieces from the bag and dip it into the egg white mixture to coat all sides, then transfer it to the crumby cheese mixture and coat all sides with crumbs and cheese. Place the coated chicken in the prepared baking dish and repeat the coating process with all remaining pieces of chicken. If any of the crumb/cheese mixture is remaining, sprinkle it over the top of the chicken in the dish. Lightly mist the tops of the chicken breasts with cooking spray and cover the dish with aluminum foil. Bake for 35 minutes. Remove the aluminum foil and bake for another 10-12 minutes uncovered until the coating is crispy. When the chicken goes back in the oven, combine the cream of chicken soup, sour cream and butter in a small saucepan and bring over medium heat. Cook, stirring occasionally, until the sauce is heated through. When the chicken is done, serve the sauce over the chicken. One serving is two pieces of chicken and 3 tablespoons of sauce. Looks really good! Will be making this week. Marlene, I wanted to calculate that, too. By my estimation, each of the 12 pieces of breast meat will be about 2.5 ounces, and since a serving is two pieces, each serving of chicken will be about 5 ounces. Can you also share your green bean and garlic recipe? OMG the whole dish looks amazing. I put the nutrition information into my weight watchers app and it’s says it’s 8 freestyle points per serving. It looks delicious and I’ll still be making it though! Could you tell me how many freestyle points if the sauce is omitted? I only have the points calculated for the way I’ve presented the recipe. If you’d like to make changes you can always run the ingredients you’d like to use through the recipe builder on the Weight Watchers website! this may be a dumb question – but for the cup of cornflake crumbs… a cup of cornflakes crumbled, or crumble until you get a cup.. because this could change the points a good bit. It’s a cup of crumbs! You can buy corn flake crumbs in a box by the other bread crumbs at the supermarket, I do not crumble them myself. Am I am dummy? Where is the recipe for the cream sauce?? I see the ingredients but not the recipe?? I made this for dinner last night and it was delish! I can’t wait for the leftovers at lunch today. Can you please clarify what you mean by “50%” sharp cheddar? Is that the same as “light” sharp cheddar? I was wondering if the chicken can be made in the air fryer. If so, can you please post instructions? Looking forward to making this for dinner asap! Thanks for the recipe! Hi Karen, I don’t own an air fryer so I can’t provide instructions, I’m sorry! I am planning to make this and I am using my air fryer. Going to use the chicken setting (360F), place them in the basket and spritz with cooking spray. I usually go 7 minutes and check them, turn them over, and add a few more minutes or until done. One other thing I’m going to adjust is the cheese… I have cheddar cheese powder I’m going to use in place of the cheese. I’ll get the same great taste, and the points will be lower (and I need to use it more than I currently do). Hope this helps. delicious, whole family loved it, a keeper! I made this for dinner tonight. First let me say it was scrumptious. I was skeptical about the canned soup for the sauce, but it was fine. I haven’t used canned soup in years. Next time I will do a couple things differently. I shredded my own cheese and probably should have used the smaller grater side or purchased pre-shredded fine cheese. Weirdly the cheese never melted. Is it supposed to? I also cooked it in my convection oven. It came out just fine — nice and crispy, but I wondered if it was because I used the convection setting that the cheese didn’t melt. Next time I will just use my oven on the regular setting. Would highly recommend. Absolutely delicious! Made this tonight for dinner and it was awesome !! My husband couldn’t get enough !! I will definitely make this for company … your recipes are wonderful !! Thank you for all you do for those of us who are trying to eat better!!! sister growing up was cornflake chicken. They like to give me a hard time about itAfter making this for supper last night, my fiance calls my brother. “Hey, cornflake chicken got an upgrade. There’s cheese sauce now!” Lol. Another delicious meal. Thanks Emily!